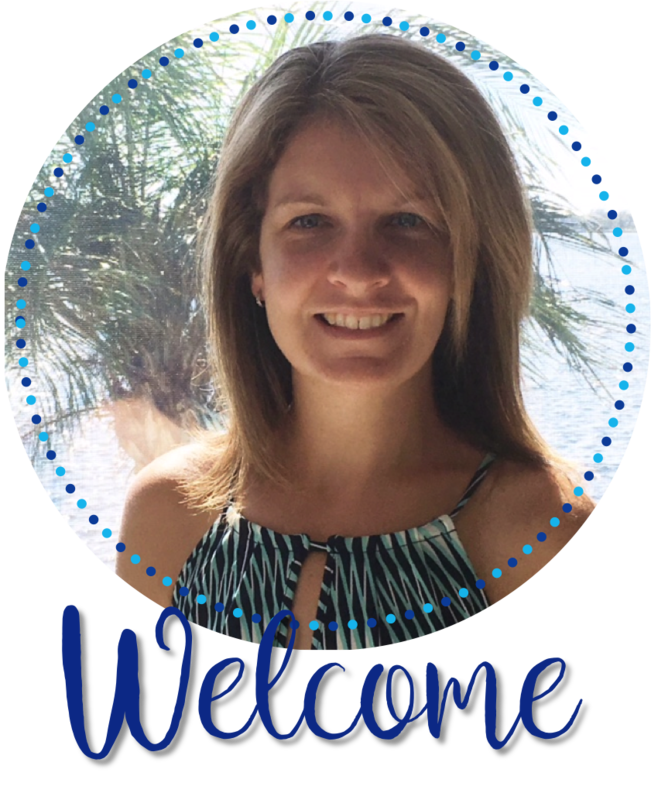 One of the awesome pieces of news is that I recently had the opportunity to collaborate with some amazing 6-12 teachers in putting together some e-Books! These books were posted over the weekend on Teachers Pay Teachers, and, honestly, they rock!! I was super excited to contribute a couple of pages...here they are! Check me out in the humanities e-Book or you can click HERE to go my free pages which are posted in my store! A huge thank you to Brain Waves Instruction, Literary Sherri, and Getting Nerdy with Mel and Gerdy for compiling these! Each e-Book profiles SECONDARY teacher-authors and shares print-and-teach resources from 25 TpT stores in each e-Book. The e-Books center around ELA, Math & Science, and Humanities (Social Studies, Art, Foreign Language, and more ELA). In them you'll find a 'meet' page completed by each seller that includes responses to 5 prompts. You'll get to learn a bit about each seller like their favorite book or things that make them happy. Then, each seller provided you with a 1-page resource that you can use in your classroom tomorrow. These e-Books are filled with awesome teachers, little insights into each sellers' life, and resources that are easy to implement in your classroom. They're pretty amazing. This past week we began studying time. We started out with a PowerPoint on time and students took notes in their interactive notebooks. For this time unit, I created 2 different types of notebook foldables, a set for time vocabulary and then a set of flipable clocks where students drew on the hands and then added the times underneath. They can use all of these as study tools to prepare for the quiz. I was also super excited to use a new time task card set, but ran out of time, so that will wait for next week. Tonight though, as I was writing this blog post from my kitchen counter, I looked outside and saw a beautiful sunset...I just had to share! Happy Friday all! Enjoy the weekend! I've seen the photo below floating around on Facebook the past few days, and it prompted me to change it up a bit and blog about the teacher I would choose. You know the one I'm talking about? The one who inspired you when you were in school or who really believed in you when you weren't sure you believed in yourself? Or maybe it's a past or current teacher/co-worker that you really admire? I've had some amazing teachers as a student and awesome co-workers as a teacher, but there is one teacher who fits into both categories. My 11th grade British Lit teacher was Mr. Argroves. He taught both English and German classes. He had been teaching for many years and had quite the reputation for being extremely tough. Everyone feared his red pen! Even though you knew your GPA was likely to take a hit in his class, students could not WAIT to get there. His wit mixed with the right amount of sarcasm inspired students to press on even while having a love/hate relationship with him. He demanded the best his students could give and refused to accept mediocrity. He had a nickname for every single student. I was always "Auntie Em" in his class. 10 years after I walked out of his class as a student, I walked back in as a Spanish teacher with him as my department head. I had been teaching for about 5 years at the time, but had recently moved back to a town close to where I grew up and was staying at home with my baby daughter. I heard of a long-term sub position available at my former high school. I was going a bit stir crazy at home, so I decided to commit to the 6 month job. His first words were "Great to have you back Auntie!". He hadn't changed a bit. Throughout the rest of that year he remained an amazing example of a teacher/leader as he continued to encourage and inspire me everyday...this time as his colleague. Two years ago, Mr. Argroves passed away very unexpectedly. He was due to retire at the end of that school year. His funeral was held in the high school football stadium and it was packed. Former students, teacher, and administrators told endless stories of how this man had affected them. He truly left a legacy! So I would choose to chat with Mr. Argroves. He would tell jokes about Shakespeare and probably insult me in some way, but he would also offer amazing insight and advice about what it truly means to be a teacher! 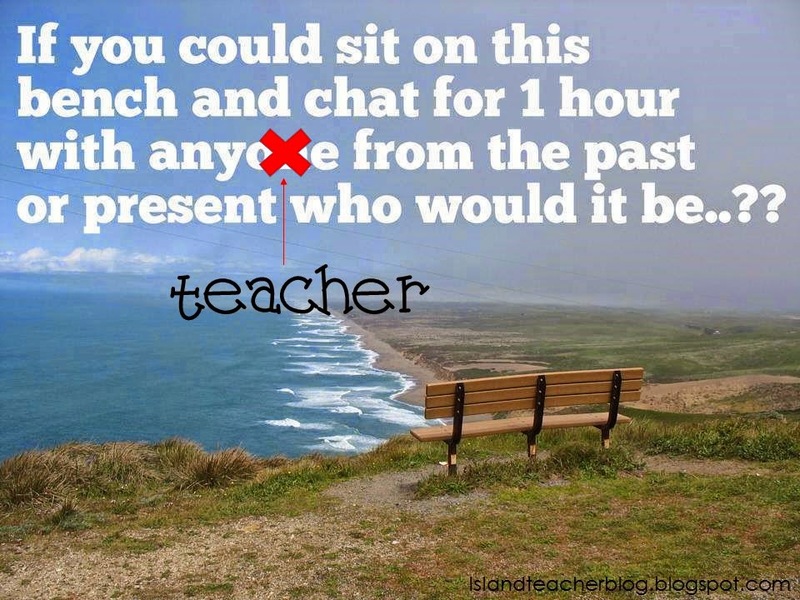 If you could chat with any teacher, who would it be? 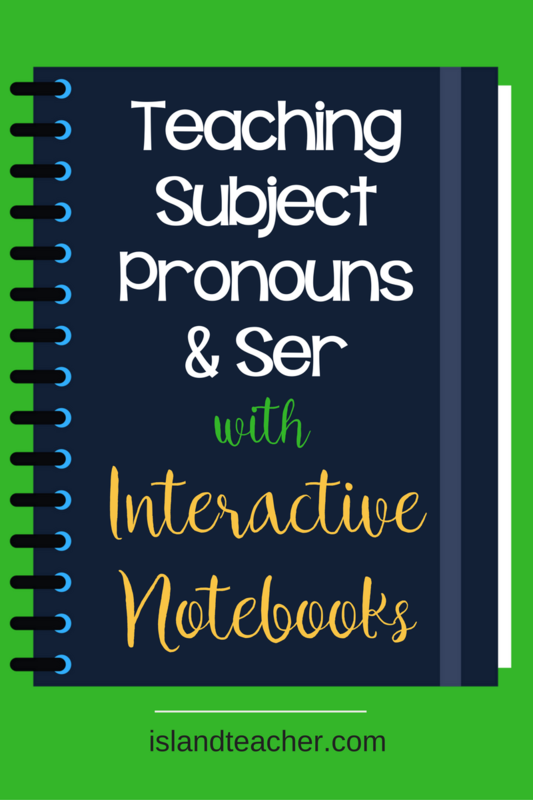 So this past week we dove more into our interactive notebooks by starting a review unit on Subject Pronouns and Ser. 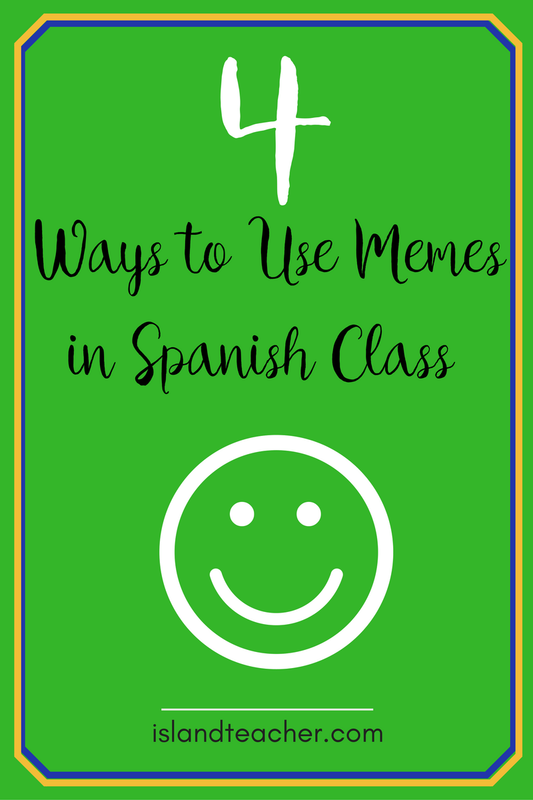 My 9th grade Spanish class has down some basics since they had Spanish once a week in Middle School, so they have a jump start on Spanish 1 already. 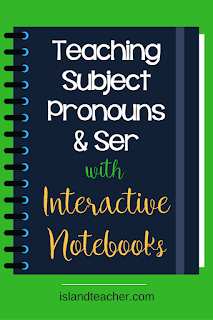 I started the lesson with Sra Cruz's subject pronoun PowerPoint which I've used for years to introduce the topic. The students took notes on one page of their notebook as we went through the PowerPoint. You can see that they are already working on using color and highlighting in their notes in the photos below. Whew...made it! Week one is over! As always, the first week of school is a bit hectic as the the year gets going. A positive (in most cases) aspect of teaching at a small school is that you pretty much know all of the students before they show up in your classroom. Many of these students are the same students I've had for the past 3 years, so we both know what to expect from each other. 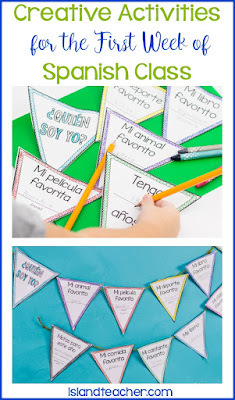 :) Here are 2 activities creative activities that we incorporated into our first week of Spanish class! 1. 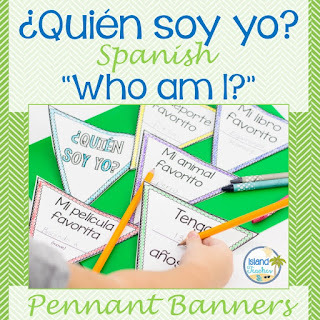 I was excited to have my students make ¿Quién soy yo? banners for the classroom. They enjoyed doing this and they added a nice touch to the bulletin board. Next time, I'll definitely have them write their answers to the prompts in a dark marker. This will definitely show up a lot better and make them easier to read from a distance. 2. Next, I was really excited to have my students set up their "cuaderno interactivo". Ok, so this took a LONG time. I'm not sure what I was expecting, but it did take awhile to explain the process and add the table of contents and grading rubric. We added the table of contents to the front cover and the grading rubric to the back cover. I plan to grade notebooks at the end of each quarter. 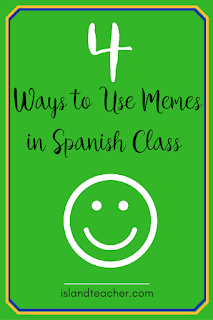 For their first notebook page, I had students brainstorm the topic "5 Reasons to Study Spanish". They then went home and created the page for their first homework assignment. I left the instructions open-ended and just told them to make a colorful graphic which included their 5 reasons. I was pretty pleased with what some of my interactive notebook newbie students came up with! Overall, a great first week!